A business that doesn’t keep track of inventory is a business that has no idea what is going on. Most small business owners are aware that they need to know how to control inventory, but what does that look like? How can you be even more efficient? Luckily, inventory control doesn’t have to be rocket science. Check out our list below and learn 6 ways to increase your control over inventory. There is so much information out there about the products you sell and who buys them that can really help you with your business inventory. You should always know what is selling best, who is buying your products most often, and when people buy. Tracking this type of data is crucial for any business that wants to thrive because it tells you what you should keep doing and what you need to change. You won’t want to make inventory decisions based on what you are guessing is going on or what you feel emotionally is the right move. In business, knowledge can give you a lot of profit when used correctly. Use this type of data to decide what stays in your inventory, when it stays or is replaced, and what you should stop selling. You don’t always need to have the same items in your inventory. As we stated earlier, people may not be buying the same things during all times of the year. For instance, sunscreen likely won’t be sold in cold winter months nearly as often as during the sunny summer. If you have been in business for a little while, you can start to see the history of what sells and what doesn’t. Use this as a guide for stocking inventory. You can base future sales off of your past sales by looking at inventory records. A sales report can give you a lot of insight into what you need to be spending and what you need to be focusing on for products. This can give you an easy to understanding starting point for when it is time to stock up your inventory. Always know where your products are when you order them to stock up and choose shipping services that are reliable. All of your products need to have their own SKU (stock keeping unit) to make it easier for you to identify what is what. When you need to find something quickly, the SKU is going to be essential in making it easy to locate in your system. It will also help you set apart your products from another business that may have something really similar. If you are a small business working with resellers, your SKU numbers are going to be really important to keep everything straight. Without them, it will get very confusing to figure out the products you have. Being able to specify what your products are and what they are made from helps you, but it also helps your customers decide if you have what they are looking for. Customers that know what they are buying beforehand are more likely to actually enjoy their purchase rather than regret it. You should definitely be in the habit of auditing all of the orders you get each day and checking the status to be sure you can fulfill the order in a timely manner. This will help with your inventory because you know what products are being bought and what isn’t at any given moment. In addition to this, getting your orders out quickly helps bring customers back. A good way to make sure that you are on top of your orders is to use inventory management software, but also make sure that you are checking the numbers yourself. Never depend on just one or the other. Double checking your work is always a wise move when it comes to sales! You may not want to audit your stock each and every day (although this is wise to do if you don’t have a lot of inventory or have many sales per day). If this is the case, you could always set it up to be monthly or even yearly if you feel comfortable doing so. Managing your inventory may seem like a simple task, but one thing that a lot of people forget is that your products should be sold in the order that they were made. For instance, whatever you make first should be sold first even if another one is fresher or newer. Don’t forget about quality control when doing this! You don’t want to sell items that are no longer good, especially when you are trying to build your business and get repeat customers. If you have products that are perishable, like food or plants, FIFO is so important to remember. To make it easier on yourself, you may want to stock your inventory in the way that it will be sold. Put the oldest items in the front and the newest items in the back so that the first ones you would grab would be the ones you made first. Every business has a product at some point that just doesn’t sell. If a product hasn’t sold for at least 6 to 12 months, it may be time for you to stop stocking it and find something else. Remember that you may be stocking it during the wrong time of the year. Earlier, we talked about how crucial it is to recognize when items sell during some months and not others. This is where that data can be really advantageous. The inventory management software you use can help you determine how long an item has been in stock. If you see something isn’t selling well, you may want to try marketing the item differently or being creative in ways to try and get people interested. 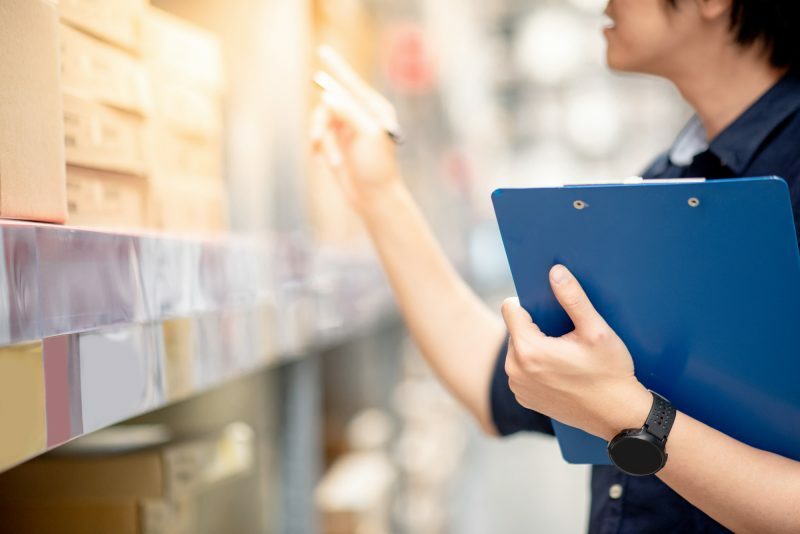 Now that you’ve gotten some helpful information about inventory control, you’re probably ready to implement some changes to your business. To get some help with shipping and courier services for your small business, be sure to contact us and learn how we can help you with stocking inventory.